As with any small town, business is the life-blood of the community. In Bennington, small and family-owned businesses make up a majority of our commercial sector. Unique to Bennington however is the fact that its natural geography allows for a vibrant downtown and commercial corridor to co-exist in a mutually beneficial environment. In Bennington it is the job of the Office of Economic and Community Development (OECD) to proactively shape the landscape of the Town by assisting with the growth of business and the community in which they exist. Specifically, the OECD provides support in the form of advocacy, revolving loans, tax incentives and networking to both existing and potential businesses. 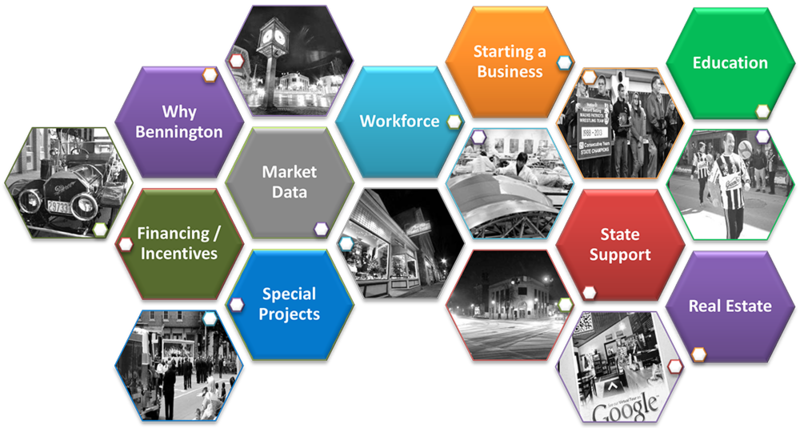 The OECD plays an active role in the municipality’s efforts to make Bennington an easy and friendly place to do business. It is the belief of this office that there is no better place on earth than here in Bennington, VT – because of its extreme high quality of life attributes and friendly residents. 1. Proximity: Located at the main intersection of Rt. 9 from Albany, NY to I91, and Rt. 7 from Connecticut to Canada, Bennington is primed for business attraction. Bennington’s location also provides an advantage that is rarely found in other states. Our small size allows for the creation of close relationships with local, state and federal lawmakers. Albany, NY = 40 mi. Boston, MA = 150 mi. New York City = 182 mi. Montreal, QC = 230 mi. 2. 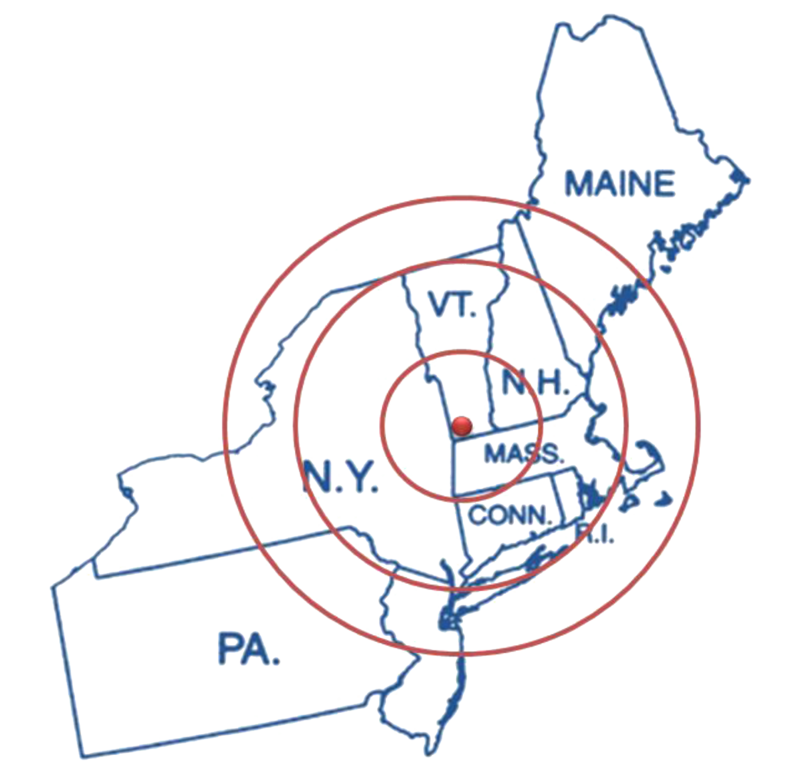 Transportation: Bennington’s landscape provides for rail freight, air and highway transportation, and with a local air facility and Albany International Airport less than an hour away, professionals can travel internationally with ease. In addition, public transportation allows for commuting to and from work and occasional trips throughout the region. 3. Incentives: Even though Vermont is a small state, it packs a big punch. Local and State incentive programs provide support to new and existing companies in a number of different ways. Vermont is the only US State that has a state-wide EB5 program which is designed to allow international investors to secure visas in exchange for investments made in the United States. Bennington is also identified as a foreign trade zone allowing for easier shipping of materials outside the U.S.
4. Workforce: With 5 colleges, a career development center, and a high school that is focused on the practical application of skills learned, Bennington has identified workforce development as one of its top priorities. Current efforts have assisted our composites cluster in the creation of a local technicians program and the national need for skilled nurses has resulted in the development of advanced nursing programs. 5. Shovel Ready: With premium commercial and industrial space readily available, potential investors will have no problem identifying a location that fits the needs of their specific industry. Available properties in town include land in the Morse Industrial Park, the Maneely Industrial Park, space in three significant shopping centers, and our historic downtown. The majority of these sites are shovel ready if not ready for immediate occupancy and for companies looking to build; efforts have been made to streamline the permitting process with pre-zoned locations. 6. Lifestyle: Located in a state that prides itself on outdoor engagement, Bennington offers residents and visitors the opportunity to experience nature up close. With a community recreation center, bike trails and significant byways program, it is easy to find yourself in town enjoying our small businesses or on a back road touring our covered bridges. Bennington is also the home of the Bennington Battle Monument, commemorating a pivotal battle in the revolutionary war, and is located in the Green Mountain National Forest which encompasses more than 400,000 acres. 7. Entertainment: One doesn’t have to go far to find the artistic attributes of this community. With a significant art presence in the downtown, individuals can easily walk from one gallery to the next. This walking community would not be what it is without some cornerstones in our community. These include: the Bennington Museum, the Bennington Center for the Arts, the Vermont Arts Exchange and Oldcastle Theatre Company. With approximately 16,000 residents, the Bennington community provides a diverse cross-section of the socio-economic make-up of the region. Likewise, diverse cultures and interests drive the community forward towards a sustainable vision. Whether living, working or just visiting Bennington, this close-knit community is what keeps people coming back. Our safe and friendly environment encourages interaction and social debates that are on the forefront of the conversation across the nation. Specifically the Economic and Community Development (ECD) Office assists in the acquisition of community development block grants and other programs that are geared toward revitalization. The Town’s low interest loan program provides funding to low and moderate income families and rental units so that facilities can be maintained and kept up to code, and close partnerships with landlords and developers insure that quality housing is always available. Municipal services within the town of Bennington include water and sewer, police and fire protection, highway maintenance, permits and planning, staff code enforcement and a number of community action groups. Bennington also boasts an active downtown center with a number of locally owned shops, and active infrastructure upgrades happen annually to ensure a safe and enjoyable experience. In 2003 NWWVT became the first rural chartered NeighborWorks member in the country. NeighborWorks USA is a national network of housing and community revitalization organizations. 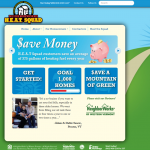 NeighborWorks of Western Vermont services Bennington, Rutland and Addison Counties by providing services to homeowners that assist with building efficiency, redevelopment and development efforts. This is primarily done through the organization’s H.E.A.T. Squad program.